Fans of Domino's pizza will gain access to a collection of new mobile ordering advantages thanks to the pizza chain's partnership with automation platform If This Then That, known as IFTTT. With the addition of new Domino's "Applets," anyone ordering a pizza from the restaurant who owns a few connected smart home products -- like Philips Hue -- will be able to receive notifications about their order update in interesting new ways. 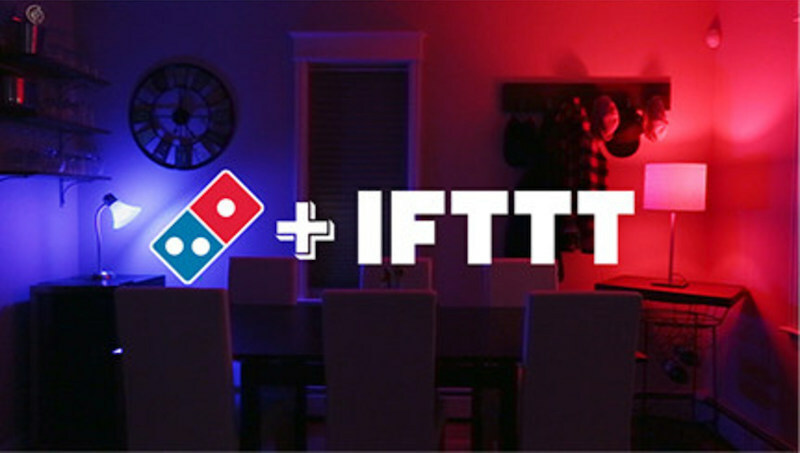 As the first restaurant brand to join IFTTT and create an Applet, Domino's has listed a few useful IFTTT commands of its own to celebrate the partnership. One of the most notable Applets sends a signal to a user's Philips Hue bulbs, changing the lighting color at various intervals of the order's progress, like switching over to blue when the pizza has been placed in the oven. Other Applets will turn off a Rachio Smart Sprinkler system when the Domino's order is out for delivery, preventing potential mishaps for the delivery person, and even activate a Samsung POWERbot vacuum when the order is being prepped to clean up the house before guests arrive. "We understand how much people love using Domino's Tracker, not only to know where their order is in the preparation and delivery process, but also to plan around that much-anticipated pizza arrival," said Dennis Maloney, Domino's senior vice president – chief digital officer. "And now we're empowering customers to unleash their imagination as they create new ways to integrate some of our favorite innovations, like Domino's Tracker, into their everyday lives. Thanks to the endless possibilities of IFTTT Applets, customers will be more connected than ever." To sync up IFTTT and Domino's Tracker Applets, users can download the IFTTT app on iOS [Direct Link] or Android devices. Although Domino's Applets are limited on the restaurant's IFTTT page, users will be able to create any number of commands on the automation app platform, including text message-based alerts about orders. The Galactic Encyclopedia 3578 Edition - History of Humankind - Part 583(b): 2017 and Beyond. Around this time, humans said technology would be used to solve global warming, end poverty and promote a more peaceful, equal and stable world. But first of all they had to sort out blinking lights that told them how their pizza orders were doing. This, by itself, did not significantly contribute to the following disasters that befell Earth in the years to come, but many scholars now point to such examples as symbolic of the supremely interesting priorities humans chose to invest time, money and effort in during this era. I was skeptical of this article from the headline, but you know what? This sounds like it could be fun. Not everything has to be super serious. It's a pizza. Alot of anti pizza delivery chain snobbery here. Perspective: it's food that you are paying a stranger to bring to your house so you can eat it. if you want "gourmet" "authentic" pizza, eschew the conveniences, get in your car, and drive to a pizza restaurant. PizzaHut and Domino's is what people consider "good" pizza? Sorry guys thats just pitiful. Still not a big fan of Dominos, though it's a much improved product since they overhauled it a few years ago. We order it every now and then because the kids like their cinnamon bread, and they have the absolute best app. I wish eating their pizza were as enjoyable as ordering it—the tracker is kind of fun and I might actually apply the hue recipe to my IFTTT for those times when we end up ordering. PizzaHut is pretty darn good, even by "good" pizza standards. I hope the smiley means you were joking about everything you wrote. It is kinda sad that they've turned to automation technology to make the delivery person's life much easier. True, except for a lot of people. Putting on the sprinklers when the pizza delivery guy enters the front garden. This might just well compensate for its taste. Yes, agreed, they're eatable, fills your stomach and won't kill you. But please don't claim these chains' produce are actual good pizzas.